MOSCOW, March 25. /TASS/. 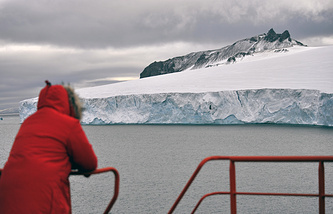 Russian and Chinese scientists will organize joint studies of the Arctic and Antarctic, they will explore mineral and biology resources in the global ocean, the Russian Academy of Sciences’ Vice President Andrey Adrianov told TASS after the first meeting between representatives of the Russian and Chinese Academies of Sciences in Beijing on Sunday. "Today, representatives of the Russian and Chinese Academies of Sciences had a meeting, which also featured directors of China’s several ocean studies institutes," he said. "We have agreed to expand geography of our cooperation." "Presently, we cooperate in the ocean’s north-western area, and the Chinese experts are interested in taking part in our Arctic studies, they are also interested in joint studies of the Antarctic," he continued. "We have agreed to exchange experience in research and in search for underwater mineral and biology resources, in equipment for that work, including deep submersibles." "We have also agreed to have joint Arctic expeditions with Chinese experts," he added. Russia and China will have a joint symposium on March 25 - the first event in a series of meetings the scientists have scheduled. "It will focus on deep research in the global ocean, and we shall discuss also means to control the global ocean - satellite technologies, space monitoring of natural hazards in the ocean, control of the ocean surface, including the upper water layers, and, of course, the deep ocean," the scientist said. Representatives of the Russian and Chinese Academies of Sciences on Monday and Tuesday at a joint symposium on the global ocean’s deep studies will share information and experience, will discuss scientific cooperation in research of the planet’s water resources. During the working trip, which will continue to March 30, experts of the Russian Academy of Sciences will visit the Chinese Academy’s Institute of Neuroscience (ION), the Shanghai Institute of Applied Physics, the National Center for Protein Science, the Shanghai Institute of Optics and Fine Mechanics, the ShanghaiTech University, and the Shanghai World Financial Center.